As the new Lombok takes shape welcoming ever increasing numbers of international tourists, tradition and heritage remains as important as ever, keeping alive many unique practises. A prime example of this can be seen in its legacy as a major producer of home-grown pottery. Sasak pottery not only showcases age-old artistic skills passed down through families but also as a celebration of rural community life in Lombok. The Sasak pottery of Lombok has garnered a global reputation in recent years for its distinct style and decorative features, and especially for it's very traditional creative process – in many cases completely by hand. Very specific skills, which have changed little in generations, are passed on from mother to daughter and the most intricate designs can take months to complete. 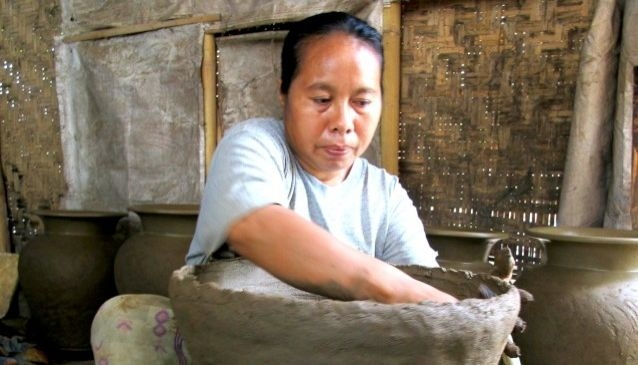 Sasak pottery is hand-coiled, pit-fired earthenware pottery. Made by hand by village-based cooperatives run by local women, the cottage-industry style process is as much of a fascination to visiting tourists as the end product. Curious visitors can watch, learn and get creative themselves with clay or help out preparing the raw material. The hills surrounding the major pottery-producing villages have abundant reserves of raw clay but collecting it is arduous work. The clay is then shaped using either bare hands or very primitive tools made from wood, bamboo and stone. Formed pots are left to dry naturally under sunlight, followed by the slow and very deliberate etching of traditional designs into the clay. Firing the kiln is also a simple affair – heated by coconut husks or wood, slowly transforming the dark grey clay into a shiny reddish brown work of art. With a little exposure to Sasak pottery design, it is easy to identify the very conspicuous traditional themes, but these potters also have one eye on the future, producing functional modern earthenware too. This includes big decorative jars, incense boxes, tableware and garden lanterns. However talent alone is not enough to keep alive a long-held tradition in the modern age. A New Zealand aid program has been working with Lombok pottery villages for almost 25 years providing some financial aid, assistance with marketing their products, and building a sustainable future for the villagers. Efforts such as improving overall quality control has secured a viable future for these villages and has helped new generations appreciate the value of keeping alive artistic heritage. Sasak pottery complies with relevant food safety standards in the USA and Europe. Banyumulek is the most convenient pottery village for a trip out of Senggigi or Mataram, surrounded by rolling rice fields in the Kediri district. Banyumulek potters create very functional earthenware in a variety of traditional designs which are often used in ceremonial rituals and village celebrations. Planter pots and intricately designed bowls are also produced in a variety of sizes popular with the tourist market and often found in ceramics showrooms in the city. The village of Masbagik is the most isolated of the three main pottery producing centres, around 40 kilometres from Mataram. Designs feature geometric patterns and artistic designs with triangles of bone inlay. It is renowned for its classic tall jars which make great pieces for home decor. Serving bowls and the "jambangan" casserole bowl are also very popular. At Penujak, very close to the international airport near Praya, the potters use simple kilns to fire their pottery which often has carved designs and embellished with frog and lizard motifs. Potters from this village make very large jars and a large variety of tabletop pieces. The nicely designed earthenware platters make excellent fruit bowls or serving plates.